… and I have no idea what it is. I used to blog actively on my tutorial site, TeamTutorials. In it’s prime the site would see over 100k page views per month. Even in the prime the site barely met the $100 Google AdSense monthly payout threshold. After 2-3 years of not posting it now the site receives 5-6k visitors per month. That’s a significant decrease. The main reason I kept this site was because it used to cover hosting on my dedicated server so I could run other project on it. After traffic died off the site would average less than $10 per month in AdSense revenue. Well a few weeks ago I remember going into the AdSense UI and changing some things. However, I really can’t remember what I changed. I think I created a new channel and updated all my tracking codes with that channel. I think I may have turned on some kind of delivery optimization settings. I seriously can’t remember exactly what I did. This is like the worst AB test I forgot to actually monitor. Now, I don’t consider $60 a month impressive at all but the fact that my earnings increased by such a high percentage is interesting. 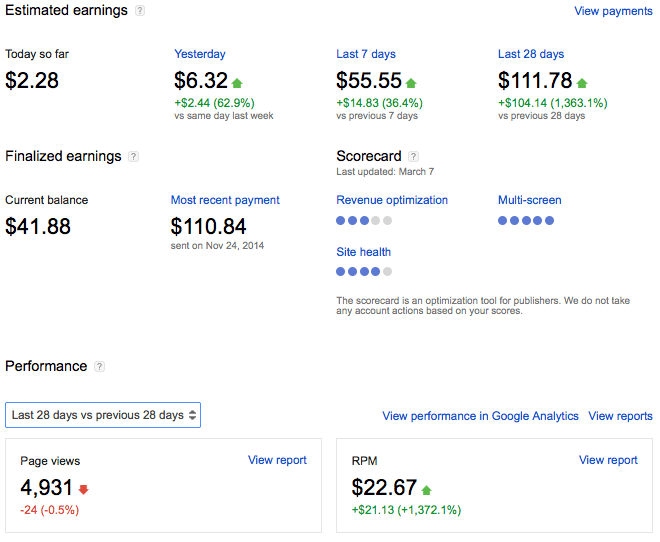 I find the RPM (revenue per thousand views) of $22 to be quite high. In my experience I’ve always had a hard time reaching more than $2 RPM (aka eCPM). It has always been especially difficult for me to monetize sites that revolve around tech as those readers tend to be ad blind or use an ad blocker. After a few months I went back to check my stats and they returned to the “normal”, pre-change levels. What I think is happening is that there must be a good bit a fraudulent traffic. When a new site is added Google doesn’t seem to adjust for this. After I got some traffic history all of my earnings decreased, including the numbers I showed above. The payout ended up being about 1/10 if the originally reported earnings. Adjustment for fraudulent/bot traffic is the only assumption I can make at this point. I’m not sure if my site is being specifically targeted or if this is common across AdSense properties.